This article is about the building in West Kensington, London, UK. For the character in the television series "House", see List of House characters § Family members. Blythe House is a listed building located at 23 Blythe Road, West Kensington, London Borough of Hammersmith and Fulham, UK. Originally built as the headquarters of the Post Office Savings Bank, it is now used as a store and archive by the Victoria and Albert, Science and British Museums. In the 2015 Autumn Statement the Government announced it would fund new storage for the museums and then sell off Blythe House. Blythe House was built between 1899 and 1903 as the Headquarters of the Post Office Savings Bank, which had outgrown its previous offices at Queen Victoria Street. By 1902 the Bank had 12,000 branches and more than 9 million accounts, with some 4,000 headquarters staff. The complex included a post office, "intended mainly to deal with the extensive official correspondence involved in the work of the Savings Bank." The post office handled a ton of post (about 100,000 letters) every working day. The post office building still houses the West Kensington delivery office. The main hall on the ground floor gave access to the offices of the Controller and his staff, and also the Public Enquiry Office. The first floor housed the correspondence branches, while the ledger branches were on the floors above. The top floor was mostly taken up with dining rooms and a kitchen. Approximately 1,000 of the staff were female; to avoid the risk of improper mixing of the sexes, females were segregated in the south block of the building, which had its own entrance. The work of the Bank increased greatly during the First World War, and by 1919 additional staff were spread over six outstations (including at the new Science Museum). An extension to the East (as envisaged in the original plans) was built starting in 1921, which could accommodate an extra 1000 staff, at an estimated cost of £150,000. By the 1930s continuing increases in the Bank's business, and the proposed move of the Savings Certificate department to Blythe House, necessitated further expansion and Treasury authority for a western extension was given in 1938. However, presumably because of the looming threat of war, the scheme was omitted from the Ministry of Works building programme, and planning postponed indefinitely. The western extension was never built. In 1963 the government announced that the Bank's main centre of operations would be moved to Glasgow, in line with its general policy of dispersing civil service departments out of London. A small headquarters staff remained in London, moving to Charles House on Kensington High Street. The Bank finally vacated Blythe House in the early 1970s. It was rumoured that the restaurant chain J. Lyons and Co., whose food preparation factory Cadby Hall was adjacent to Blythe House, wanted to acquire the site. Hammersmith Chess Club used Blythe House as their home venue for a period of time in the mid 70's, having moved on from a draughty and cold St Paul's Church Hall nearby. In the summer of 1979 Blythe House was used for the temporary exhibition of gifts to the Queen from the All-Japan Handicraft Cultural Association, given in connection with the Silver Jubilee celebrations. The British Museum from previous stores at Crayford, Kent; Shepherdess Walk; and Edgware Road. The Science Museum, including items from the Wellcome Trust collections; a conservation laboratory, a photographic studio, and a quarantine area where newly arrived items are examined. The Victoria and Albert Museum (from previous stores at Perivale; Leighton House; Ruskin Avenue, Kew – the present site of The National Archives; and Hounslow), including the Archive of Art and Design; the Beatrix Potter Collections; the V&A Theatre and Performance Archives; and the V&A's own institutional archive. Blythe House was designed by the Office of Works under Sir Henry Tanner. Its overall style is Edwardian Baroque in pinkish-red brick with Portland stone dressing. The building is four storeys high, with attics and sub-basements, and comprises long north and south ranges which are linked by two cross-ranges. The original plans intended for east and west ranges to be added, forming a rectangular plan; the east range was built 1921–22, but the west range was not built. Until around 1925 the building had its own power station, supplying electricity to passenger and goods lifts, printing presses and more than 11,000 lamps; the chimney, centred to the south of the building, is in the style of a campanile. Pevsner described the building as contributing to a "curiously muddled area …its vast bulk not very convincingly dressed up with Wrenaissance trimmings." The walls of the main workrooms were clad in glazed bricks, rather than the usual plaster. These were said to "afford a good reflecting surface for light and are also to be commended for sanitary reasons." This may have been a retrospective justification: the Controller of the Bank was initially against the innovation as being cold and prone to condensation, and preferred plastering. However, the plasterers were at that time on strike, and completion of the building would have been delayed by six months if the glazed bricks were not used instead. He was also swayed by seeing similar bricks used in the new offices of the Prudential Assurance Company. Blythe House and the associated post office were listed grade II in 2004. 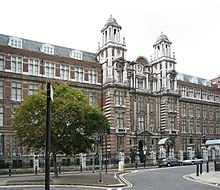 Blythe House was used as a location for television series in the late 1970s and early 1980s, including Minder and The New Avengers. The building is featured extensively as the fictional headquarters of "The Circus" in the 2011 film Tinker Tailor Soldier Spy. Used as exterior shots of ITV drama 'The Halcyon'and the BBC/Netflix series "The Crown"
Michael Collins was employed as a boy clerk at Blythe House from July 1906 - April 1910. ^ https://www.gov.uk/government/publications/spending-review-and-autumn-statement-2015-documents/spending-review-and-autumn-statement-2015 "The government will also provide £150 million to provide new world class museum storage facilities to replace Blythe House in London." ^ a b c Historic England. "Details from listed building database (1390961)". National Heritage List for England. Retrieved 21 September 2011. ^ a b Historic England. "Details from listed building database (1390960)". National Heritage List for England. Retrieved 8 October 2011. ^ "A Brief History of Hammersmith Chess Club - Hammersmith Chess Club". Hammersmith Chess Club. ^ "British Museum Act 1963 (Third Schedule: Sites of Authorised Repositories, as amended)". Her Majesty’s Stationery Office. Retrieved 21 September 2011. ^ "Blythe House – About us – Science Museum London". Science Museum (London). Retrieved 21 September 2011. ^ "Archives – Victoria and Albert Museum". Victoria and Albert Museum. 17 September 2011. Retrieved 21 September 2011. ^ "Closure of Savings Bank Electric Plant Power Station; agreement for the supply of electricity by the Hammersmith Borough Council (NSC 23/7)". National Archives/Post Office Savings Bank and Post Office Savings Department. 1919–1925. Retrieved 21 September 2011. ^ "Film London – September 2011 – Blythe House". Film London. Retrieved 21 September 2011. ^ Coogan, Tim Pat (1990). Michael Collins. London: Arrow Books. pp. 15–17. ISBN 0099685809. ^ Mackay, James (1996). Michael Collins - A Life. Edinburgh: Mainstream Publishing. pp. 27–38. ISBN 1851588574. ^ Hart, Peter (2005). Mick - The Real Michael Collins. London: Macmillan. pp. 26–29. ISBN 1405090200. This page was last edited on 25 February 2019, at 17:33 (UTC).